The restructuring is approaching its conclusion, the drive towards stability has almost arrived at the destination. 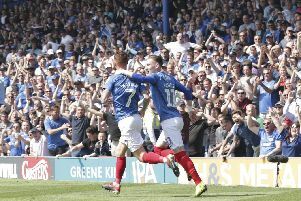 There has been a remodelling of Pompey’s backroom set-up in recent months with an eye on future prosperity. We are trying to get to the point where the structure is in place in which people are working for the club so when the manager leaves they stay. It is sensible and a lot of clubs are starting to adopt that now. Andy Melville’s employment as head of recruitment is the latest step forwards and, in the eyes of Mark Catlin, an important one. The Blues’ chief executive is accompanying Andy Awford in the push to implement a different Fratton Park structure. Its focus involves bringing backroom figures under the remit of the club rather than a manager. Such an approach is designed to keep foundations rigidly in place rather than seeing them torn up and starting from scratch on every occasion a manager departs. For Catlin it is a common-sense approach to stability – and he is confident it can be crucial in the club’s ongoing progress. He said: ‘There has been a gentle change in structure within football and I know this because I speak to a lot of clubs. ‘If you went back 20 or 30 years, almost 100 per cent of clubs handed the budget to the manager, he hired and fired his backroom staff and players, he did everything. ‘Even now there are still some managers – and I won’t name them – that when they go into a club tend to sack everyone and bring their own staff but that is getting less and less. ‘Clubs these days are trying to recruit the best people, which is pretty commonsensical to a degree. ‘Yet while it happens in every business, it previously didn’t seem to happen in football. ‘The manager is obviously still involved in employing people and has the final say but ultimately that employee is an employee of the club and not necessarily the manager. ‘Should the manager leave – in a good way or bad way – we have seen plenty of times all the staff going as well, which is expensive and you don’t get the stability at the club. ‘So we are trying to get to the point where the structure is in place in which people are working for the club so when the manager leaves they stay. ‘It is sensible and a lot of clubs are starting to adopt that now. ‘The manager can bring his right-hand man in but pretty much that is it. ‘Andy is a sponge, he absorbs information and along with myself, the chairman, the board and backroom staff, he has been a driving force of this. The arrival of Gary Waddock as assistant manager in December has also been perceived by Catlin as a key move. He added: ‘One of the things we talked about with Andy in November and December was how he was so involved in every aspect of the club. ‘He was working 24/7 and while that is admirable and we all love him for that, there was a realisation from him his main focus needed to be the first-team. ‘Andy was probably doing too much, if I am being honest.